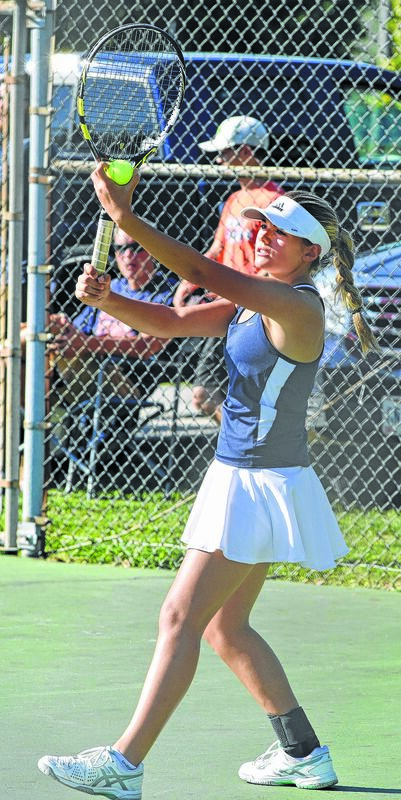 SHELBY — Galion’s Kayley Gimbel advanced Thursday to the Division II district tennis tournament in Bowling Green next week. She and the rest of the Tigers spent Thursday in Shelby taking part in the sectional tournament. Gimbel won her first match, 7-5, 6-1 against a player from Norwalk. She then topped an Ontario foe in three sets, 6-2, 2-6, 6-1. The final match was the easiest of the tournament for the Tigers’ No. 1 player, she shut out her opponent from Mansfield St. Peter’s 6-0, 6-1. Katherine Talbott and Jalyn Oswald, found their seasons coming to a reluctant end on Thursday. Talbott advanced to the second round with a 6-0, 6-2. In the next round, Talbott fell to a player from Upper Sandusky 6-2, 2-6, 1-6. A freshman, she went 17-4 this season in singles. Jalyn Oswald breezed to a 6-3, 6-3 victory in her opening round. Her opponent from Norwalk knocked her out of the tournament, 6-3, 6-3. She finished her singles season with a 20-4 record. She was also the MOAC champion at third singles. In doubles action, Kiersten Gifford and Orchid Parsons lost in the first round, 6-0, 6-1. Katie Baughn and Marissa Breinich lost 6-2, 6-3.